We all know the feeling. You come to the end of a sentence, or a paragraph, or a page—and suddenly realize you have no idea what just happened. From a psychological perspective, this is a fascinating phenomenon. Somehow, while a part of us thought we were reading happily along, another part was off somewhere else—ruminating on some joke we recently heard, fretting about an upcoming assignment, or planning dinner. But whatever it is in the mind that allows us to basically be just wrong about the contents of our own thoughts (to believe we’re learning about mating practices of chimpanzees but really be hankering for spaghetti carbonara), one thing that’s certain is we can’t have this happen while we’re tackling a long reading passage in the Verbal section of the GRE on Test Day. Spacing out may be fine to varying degrees in the course of everyday life, but it can’t happen during the GRE. Tip 1: Put yourself in the author’s shoes. GRE passages are often culled from, or imitations of, genuine texts from scientific, literary, or historical publications. What that means is that someone spent time and energy crafting the argument you see before you. Someone had a real-live thought, opinion, or belief that he or she wanted other people to know, and sat down in front of a keyboard and carefully deliberated about how best to convey this idea to a non-expert reader. By imagining this person’s motivations, you can often end up with a much more vivid picture of the content and purpose of the passage. What is the principal idea the author is trying to get across? If you were the author, how would you express these ideas? Visualizing a real person typing real ideas onto a real computer screen is a great way of plucking abstract notions from the ether and dragging them down to earth. Tip 2: Engage emotionally. If someone asked you comprehension questions about what happened in the gripping last season of Breaking Bad, you would have no problem picking out the right answer. Why? Because human beings remember better things they actually care about. When something matters to us, our brain is more active, forming neural pathways that you can draw from in subsequent memory tasks. 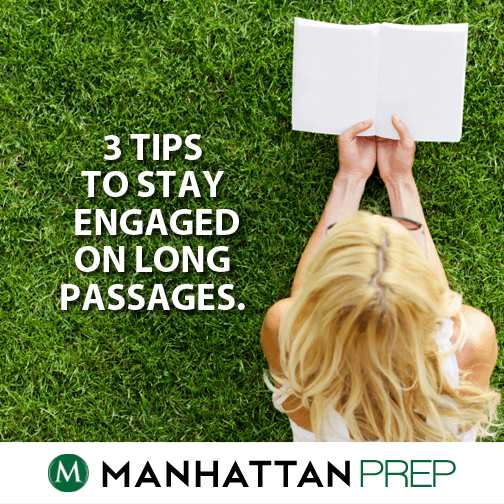 The more you can bring yourself to care about the content of the passage, the stronger your activation signal will be, and the clearer your mental picture. Many people find science passages particularly daunting, and immediately zone out at the sight of words like “electrochemical” and “tectonic.” If you imagine, though, some epic drama taking place between, say, the earth’s molten core and the hardened outer crust above it, you may find that previously yawn-worthy topics take on a certain pizzazz. Tip 3. Know what NOT to read. 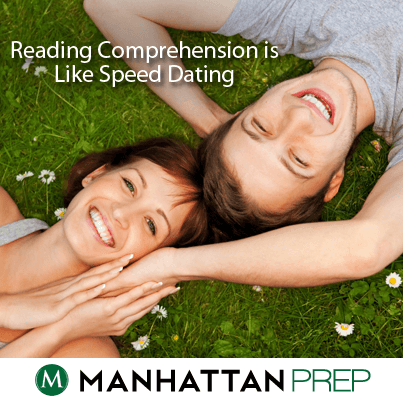 The trickiest part of the GRE is timing. Many people feel like they’d have no trouble getting all the answers if they only had enough time. Unfortunately, given these temporal limitations, our job is rather to read as efficiently and effectively as possible—so get good at knowing what not to read. When you see a list of complicated terms, make a note of where it is, but just say No to laboring over each of its tiny details. See an in-depth description of some tangential topic? Just say No—and make a note of where it is. Come across a lengthy aside that seems unrelated the main idea? Again: say No. You don’t have time to get bogged down in these details. Sure—if a question comes up about them, you’ll know where to look. But for now, you’re reading Big Picture. Overall, then, the key to your success is going to be about striking the perfect balance. Engage deeply the text, but don’t get too sucked in. The more you can cultivate these strategies as you practice, the better off you’re going to be when facing those initially unnerving—but ultimately conquerable—passages on Test Day. Imagine two friends, Gina and Tina, who are going to a speed-dating event. Gina really, really wants a boyfriend. Tina is just going because Gina dragged her there, and she’s only willing to date someone who is perfect for her. At the event, Gina finds herself liking every guy that she meets: Guy #1 is smart and successful, so it makes sense that he’s proud of his accomplishments. Guy #2 is really funny and clever. The waiter just didn’t understand his jokes. Tina, on the other hand, has a very different impression of these guys: Guy 1 has been bragging about himself the whole time, and seems arrogant. Guy 2 thinks he’s funny, but he’s actually being cruel and making fun of people. At the end of the event, Gina can’t decide which of the guys she likes best, because she has found reasons to like all of them and she has overlooked any reasons not to like them. Tina, however, was looking for reasons not to date these guys, so she notices these dealbreaker flaws. She has managed to whittle the list down to one person whose personality matched hers. Of course in real life, dating is subjective, and what might be a dealbreaker for one person might be fine for someone else! On GRE Reading Comprehension, though, there are definitive right and wrong answers, and we have to learn how to spot the wrong ones. When it comes to Reading Comprehension on the GRE, you want to act like Tina, not Gina! You will often be presented with questions whose answer choices all seem to have appealing qualities. If you’re looking for what makes an answer right, you may overlook certain critical flaws, and talk yourself into choosing a wrong answer. If you’re looking for what makes an answer wrong, though, you’re a lot more likely to notice those deal-breaking flaws! I’ve got an interesting* Reading Comp question for you from our new 5 lb. Book of GRE Practice Problems. Let’s try it out! Normally, you’d see several questions associated with an entire passage but I’m only giving you one of the paragraphs and one question. Give yourself up to about two minutes total to read the information and answer the question. In 1604 in Padua, Italy, a supernova became visible, appearing as a star so bright that it was visible in daylight for more than a year. Galileo, who lectured at the university, gave several lectures widely attended by the public. The lectures not only sought to explain the origin of the star (some posited that perhaps it was merely vapour near the earth), but seriously undermined the views of many philosophers that the heavens were unchangeable. This idea was foundational to a worldview underpinned by a central and all-important Earth, with celestial bodies merely rotating around it. The author mentions which of the following as a result of the supernova of 1604? (A) The supernova created and dispersed the heavy elements out of which the earth and everything on it is made. (B) Galileo explained the origin of the supernova. (C) The public was interested in hearing lectures about the phenomenon. (D) Galileo’s lectures were opposed by philosophers. Just an FYI: the full passage consists of two paragraphs, so you might have taken about 2 minutes or so to read the whole passage. Three questions go along with the entire passage; expect to spend about a minute to a minute and a half on each, depending upon the specific question type. Italics represent quotes from the passage or questions. Let’s dive in! The paragraph tells us about an event that happened in 1604: a really bright star appeared; Galileo tried to explain it; some previous views of others were undermined by Galileo’s views; those previous views were foundational to the idea that everything revolved around Earth. The question asks what the author mentions, so this is a lookup detail question; the answer will appear directly in the passage somewhere. Specifically, what happened as a result of the supernova in 1604? In addition to the long, boring reading comprehension passages (that everyone hates! ), we will also see quite short passages that are perhaps more appropriately called arguments. We might be asked to strengthen or weaken the conclusion, find the conclusion, articulate the role of a specific piece of information, and so on. Today we’re going to talk about Analyze the Argument Structure questions. We’re going to use the analysis process that we discussed in a previous article; please take a look at that article first if you haven’t already. (1) Local authorities are considering an amendment to the litter law that would raise the fine for littering in the community picnic area to $1,000. (2) Advocates say that raising the fine will make people take notice of the law. (3) They may be correct that higher fines get more attention. (4) Since the inception of the litter law, incremental increases in the littering fine have proven to be consistently effective at further reducing the amount of litter in the community picnic area. (5) However, raising the fine to $1,000 would actually have the unintended effect of increasing the amount of litter in the picnic area. (6) Picnic area users would perceive this fine to be unreasonable and unenforceable, and would disregard the litter law altogether. Select the sentence, by clicking on the passage itself, that provides support for the author’s position in the passage. The first thing everybody does is check the answer “ so I’ll tell you that the answer is Sentence 6. Even if you answered correctly, though, you’re not done! You still need to analyze the problem. Today, we’re going to do a question from the Language Power passage that we reviewed in a previous article, and we’re going to analyze that question using the how to analyze a problem process. If you haven’t already read this passage (or if it has been a while since you read it), go take a look at the Language Power article first (linked above). Give yourself roughly 3 minutes to read through the passage and take notes, then read the rest of that article. Okay, finally, you can get started on this article! Below is the full text of the passage followed by the question. McGinty divides speech into two categories: “language from the center” and “language from the edge”. In McGinty’s words, “Language from the center makes a speaker sound like a leader. McGinty suggests that language from the center is not only for those in high positions of power, but also for those of lower ranks who wish to gain more power and credibility. A speaker using language from the center exhibits the following characteristics: he directs rather than responds; he makes statements rather than asks questions; he contradicts, argues, and disagrees; he uses his experience persuasively; and he maintains an air of impersonality in the workplace. McGinty suggests that the use of language from the center can alter or create a new balance of power. These assertions are supported by studies that show that people accept leadership from those they perceive to be experts. What distinguishes McGinty’s discussion of effective communication is her focus on communication skills as a way of gaining power; this contrasts with most workplace communication theory, which focuses on communication skills as a way of preventing misunderstandings, avoiding conflict, and fostering interpersonal relationships. McGinty, however, holds that language not only helps maintain relationships but also lends authority. According to Power Talk, effective communication skill is an understanding of how situation shapes speech and how speech shapes situation and an understanding of how speech styles and the forces that affect those styles . . . can build your authority, and enhance your credibility and impact. And here’s the problem; give yourself about 1 minute to answer it.